From the Beltway (I-495). Take the beltway to Exit 6 East (Little River Turnpike/Route 236 East). Go through 9 traffic lights (the 9th light is Old Columbia Pike) and look on your right for 6601 Little River Turnpike, which is a 4 story brick office building. You will see a large sign on the side of the building with the name "Jeremy Flachs" and you may turn right onto Minor Lane (a side street) to access the building. There is a bus stop next to the entrance to the building. The intersection directly ahead of Minor Lane will be Braddock Road. If you reach Braddock Road (with a Home Depot on the right and Staples shopping center on the left), you have passed the office. You may park on either side or in the rear of the building. Take the elevator to Suite 315. For those who are familiar with my previous office, this office is 1.1 miles east of my old office on Little River Turnpike. The handicapped entrance is accessed from the rear of the building. From Shirley Highway (I-395). Exit at Duke Street / Route 236 West. As you proceed west, Duke street will change names to Little River Turnpike. When you reach the intersection with Braddock Road (Home Depot on your left and Staples on your right), you are about 100 yards from the office. 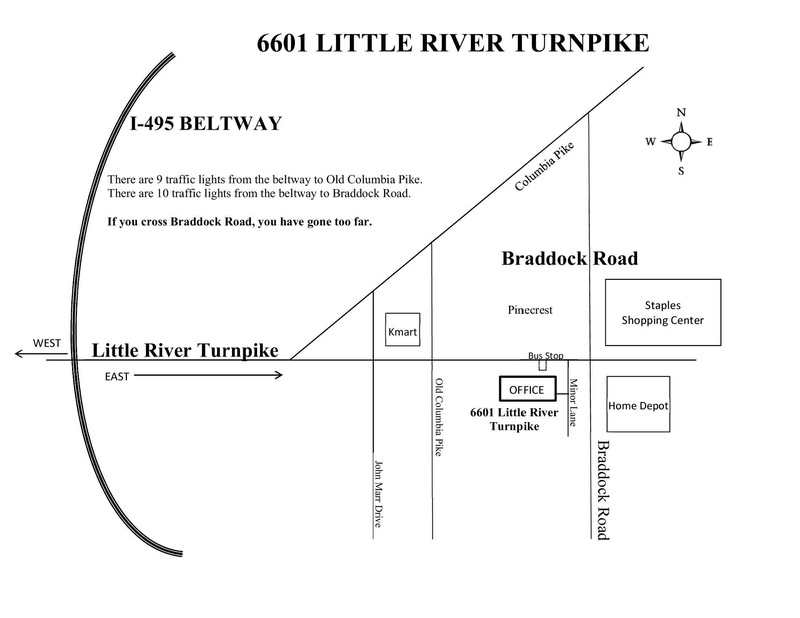 After you pass through the intersection with Braddock Road, look to your left for Minor Lane and the 4 story brick office building with the number 6601 Little River Turnpike, which is your destination. You will see a large sign on the side of the building with the name "Jeremy Flachs". Make a left turn at the opening in the median for Minor Lane, which is opposite the office building. You may park on either side of the building or in the rear. Take the elevator to Suite 315. The handicapped entrance is accessed from the rear of the building.